One of the concepts within the new wave infrastructure is that of an infrastructure ‘cloud’ which provides the computing resources required to develop and deliver applications. This application of this concept seems to be increasing throughout the industry with many companies claiming to provide their services using this approach. This project will investigate which infrastructure services are being provided, to what level of abstraction and the standards that exist while also looking for examples of adoption, the implementation approach and the expected benefits. I approached this project by first trying to get a definition of Cloud Based Infrastrucure and why it has become the buzzword, I then went about trying to find what is being offered, how it works and then examples of companies that have moved to the cloud as well as an approach we might adopt. Cloud Based Infrastructure refers to a method of delivering computing resources which are dynamically scalable over the internet which can be provided on a pay as you use approach. This has been made possible by the improvements in fast and affordable internet, virtualisation technology and the move to web based applications which can be hosted on the cloud. The resources being delivered as a service include servers, network equipment, memory, CPU, disk space and data centre facilities such as power, cooling and backups. This environment can be used to either build custom VMs or you can use a variety of prebuilt operating system templates based on your level of expertise and the control you require of the build. The benefit of such an environment being that you don’t and shouldn’t need to understand the underlying environment when creating a web application. Companies are being driven to the cloud by the prospect of scalability, cost savings and access to resources on demand while being wary of being locked into a specific cloud infrastructure which they lose control of as well as concerns of security, SLA’s and support and compliance. The technology is still fairly new with Amazons Elastic Compute Cloud (EC2) seen as an established player even though they have only been out of beta since October 2008 and most of the providers tend to be based in America. It is also difficult to find any local authorities that have adopted the public cloud, Sheffield Primary schools are the only example I found, they are among the first to pilot Gmail – Google’s free email service and Studywiz a Virtual Learning Environment (VLE). Studywiz is a flexible and scalable tool to aid teaching and engage students, teachers and parents that can either be hosted internally or externally, the benefits of hosting it externally are that it reaches a wider audience. Studywiz has been adopted by other local authorities with Southampton, Slough and Hampshire adopting it, looking at the StudyWiz web site the minimum requirements are a server running a dual 2 Ghz processor with 8GB ram and 160 GB disk space, for more than 800 users you can spread the load over 3 servers, one for the web server, one for the application server and one for the database. Sheffield council have got Etech (Studywiz) to host the application as their Corporate council IT is outsourced and opted for Googlemail in primary schools which they have been pleased with, they are now working on linking Studywiz with Googlemail. As this is still an emerging market plenty of new players have arrived, each claiming to be better than the other. For example ElasticHosts main selling points are that they are UK based giving a more responsive service to European locations along with the EU legal and data protection framework unlike the US providers. Rightscale believes data lock in concerns us most and have focused on creating a transparent platform embracing open standards to give you the tools to avoid lock-in. Flexiscale offer volume discounts and dedicated VLANs per customer and new user trial credits as well as the ability to scale horizontally (scale out by adding more nodes) and vertically (scale up by adding processors and memory). 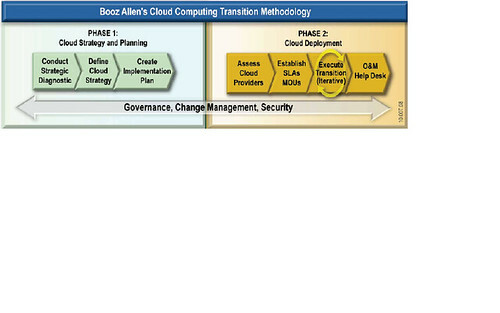 Booz Allen Hamilton is a strategy and technology consulting firm based in the US that has worked with the federal government’s migration to cloud computing. Their transition methodology to the cloud involves identifying and establishing the critical factors involved in transforming in-house IT environment to a cloud computing based environment. Their methodology involves two phases cloud strategy and planning and cloud deployment, this is model that we could use as a starting point to explore an implementation approach. The main areas that might be of interest to us are when creating test and development environments, our current test and development environment sits behind a firewall at Saltisford, this has issues in terms of opening ports on firewalls to allow users to gain access and test their applications. This has lead to test and dev environments creeping onto the production network which has the potential to be very disruptive. There is also the issue of having the resources available to host a test environment, for example the imminent move to Exchange will require testing on 64 bit hardware which has been delayed while the hardware is reclaimed from another project. We wouldn’t have this issue if we rented the computing resources we required and built the test environment on the cloud. Most providers provide simple web interfaces with which you can get started, the VM can be accessed via remote desktop or VNC with a firewall rule configuration allowing your IP address to get to the server. Having said that the solution would only be of benefit if the application you want to test is web based and you could host any back end servers such as SQL or AD in the cloud, a hybrid application whereby a part of the application sits within the authority and the other part sits on the cloud would require extensive holes required to be opened on the firewall which probably would not be approved. Working in the Windows Team we do get approached by Project Managers regarding setting up new VMs for web based applications that directorates have purchased or are planning to purchase, the projects that tend to take the longest time to completion are those that will sit on the DMZ and need security clearance. These could be piloted as a test on a cloud environment to prove they do work as well as giving the security team a chance to see the application in action as well as the customer. WE would however need to ask the suppliers of the application whether they would support an application hosted in such an environment, for example VMWare pride themselves on deliverying a virtual environment that is close to a real server, other virtualisation technologies may not be supported by suppliers. One area we may learn from is that of horizontal expansion of websites, we have had issues with load balancing the Citrix web interface and the Sharepoint Intranet page, the public cloud seems to have a solution which does enable you to scale out when demand rises. Ultimately we will need to move towards applications that do scale well.